PAG Metal Wine Rack, beautiful and attractive appearance. It is a good organizer and beautiful decor, conveniently and elegantly store your favorite wine. 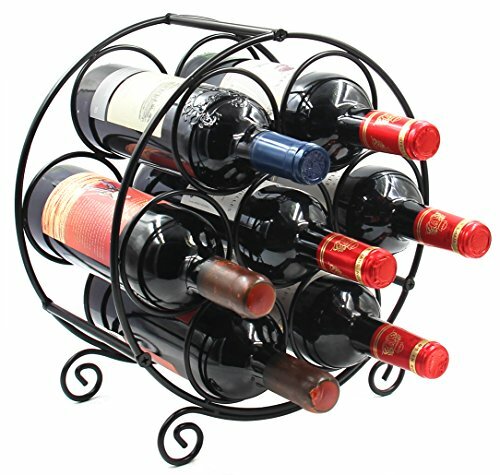 This metal wine rack has room for up to 7 standard bottles(Diameter less than 3.46inch) of your favorite wine. Each wine bottle is stored horizontally, ensuring both the wine and the air bubbles are in contact with the cork, keeping corks moist, so that the wine can be stored longer until you're ready to enjoy. Efficiently maximize storage space, matches any home, kitchen, dining room, wine cellar or bar. Circular Design. The simple yet elegant design of the wine bottle rack makes it a great display piece that you'll be proud to have out. A perfect gift to your family, relatives, friends and business partners, wine aficionado, wine collectors and expert connoisseurs in your life! Size: L12" X W6.45" X H12.74", Hole Diameter: 3.46"